9:24 PM, Friday, October 30th. The scene? My kitchen. In attendance? Myself and Craig. The event? The creation of one of the best plates of food I’ve ever made. It started like this, see, I was at the farmer’s market, taking pictures with my new camera when I spied these Jerusalem artichokes. Or was it at the butcher shop when I asked the butcher to cut me two thick-sliced pork chops? No, wasn’t it on the couch reading The Barefoot Contessa’s roasted apple sauce recipe in her new cookbook? 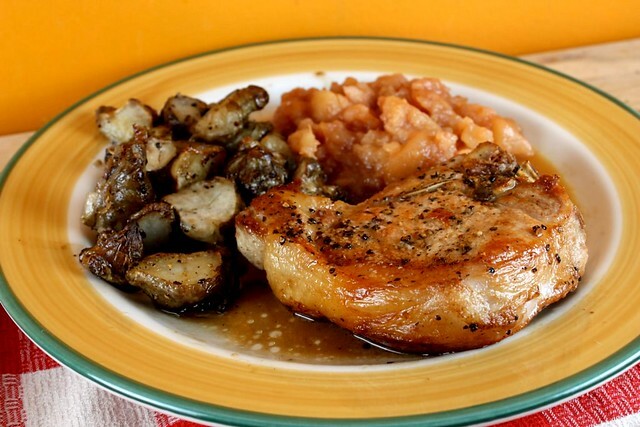 The Secret To Killer Pork Chops at Home. And that’s my full confession. Haul me away, if you must, at least I know I did what I thought was right.